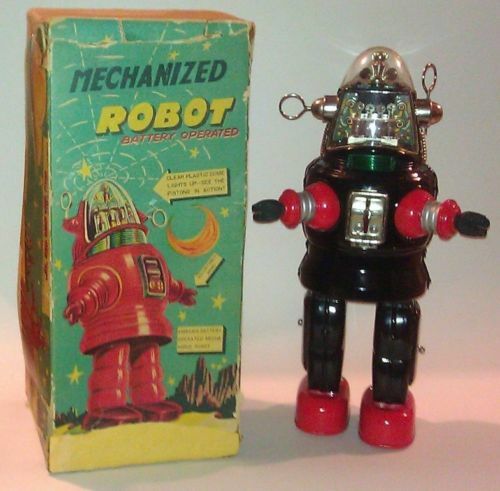 During the 1950's, the majority of battery operated motorized wind-up tin robot toys were manufactured outside of the United States by many Japanese toy companies. When these tin toys were exported to the United States, they attracted a lot of interest from American children. Because they were able to cheaply mass produce robot toys for Americans, the Japanese toy industry boomed during the 1950's. Many of these tin robots were attached to a wired remote control battery pack that kids can control while others were clockwork tin robot toys that kids would wind up so the little mechanical character would walk or spin to the delight of kids. Many had moving parts or blinking lights that would make them more exciting for children. This was an introduction to technology for kids for that era. 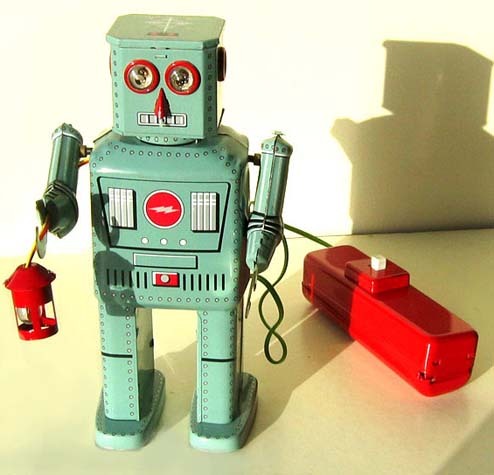 If you feel nostalgic for the Fifties, you can now shop for your own vintage Fifties robot toys on sale. You can collect classic antique wind up toys inspired by your favorite science fiction series. Popular 1950's battery operated and wind up tin toys include Daiya, Marx, Nomura, Yonezawa, Yoshiya and other brand toys made in Japan. Now is a great time to buy and collect these tin robots as more collectors are selling their mint toy collectibles at a very fair price. Review the following vintage robot sale offers from collectors and sellers online and see what kind of deals you can buy online today for your toy collection. Also, review our menu bar on the right for more wonderful classic childhood robot toys from the past!